We are bombarded with more information today than ever before. And we are enduring a period of shock in numerous ways; societal and economic changes are affecting everyone. One of the results is diversity, and an increasing number of identities per person (take how people assume different identities online for example). Is another result immaturity? In order to answer this question we must first define maturity. In terms of the science, the brain reaches 90% of its adult size by the age of 6. And a second wave takes place in the years before puberty. During this time grey matter (areas of the brain responsible for processing information and storing memories) increases in size, particularly in the frontal lobe of the brain – as a result of an increase in the number of synaptic connections between nerve cells. Also around puberty however, a process begins in which connections that are not used or reinforced begin to wither (hence the “use-it-or-lose-it” hypothesis). This pruning, which begins around age 11 in girls and 12 in boys, continues into the early or mid-20s, particularly in the prefrontal cortex, an area associated with “higher” functions such as planning, reasoning, judgment, and impulse control. As Dr. Jay Giedd of the National Institute of Mental Health has said, the real cognitive advances come with paring down or reducing the number of synaptic connections. During adolescence, the amount of myelin, a fatty, insulating material that coats the axons of nerve cells—similar to the way insulation coats a wire—also increases, improving the nerve cells’ ability to conduct electrical signals and to function efficiently; this too continues into adulthood and occurs later in “higher” regions of the brain, such as the prefrontal cortex. So this tells us why maturity is associated with puberty and adolescence. But of course we have all met immature adults. I’m not even going to claim to be particularly mature myself. I find the idea of permanent maturity to be closely associated with the word boring. Such a statement, you might think, could reflect the fact that maturity can only be judged subjectively, or relative to the society within which you live. Yet almost every major philosopher has had something to say about it, and in an objective way. Cephalos, who discussed the ideas with Socrates, argued that decency and temperament are signs of maturity. J.S.Mill argued that socio-economic traumas led to immaturity, which could perhaps explain the growing popularity of extremism in hard times. If a societal trauma led towards a lessened state of maturity, then to Mill the state would be justified in limiting liberties. Lord Brain argued that in the pursuit of maturity personal experiences far outweigh “any public account which science can give”. Indeed these quotes are only the tip of the iceberg in terms of the number of different ideas that people have about the concept. Perhaps the most intriguing thing about them however, is that everyone judges maturity to be desirable. Yet as hinted at by Mill, immaturity could be argued to be a psychological coping mechanism. Indeed we often associate Multiple Personality Disorder with the word illness. But why do we do this? It’s essentially because MPD makes it more difficult to fit into modern society, where you need to retain the stability to hold a job, and family relations. But our ability to supress overly traumatised parts of our mind, and create new personalities, is one of the most fascinating and amazing capabilities of human mind. If a person with MPD had several non-mature personalities, would you think this a bad thing? There really are a thousand questions that I could ask on this topic. How do you define maturity? Is a mature person the one who best works out how to live with the hand that’s given to them? Is the mature person one whose understanding transcends that which they experience in their own personal lives? Is a mature person one who, as Mill said, can learn from discussions with others? Is a mature person a moral person? I would love to hear your thoughts to any aspect of this subject. But most of all, how would you define maturity? And do you agree with Mill that your right to freedom should rest on your level of maturity? 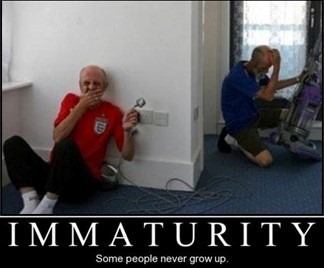 I think maturity and immaturity have a lot to do with children. We call a person immature when we see that person behaving in a way that we associate with children. And we call a child mature when we see that child behaving in a way that we associate with adults. What kinds of things do we associate with children? Perhaps giving a lot of weight to one’s point of view. Or focusing too much on relative fairness vs absolute abundance (Paul Bloom has cool studies on this). Or having our reason overwhelmed by emotions. Alain de Botton used the phrase “aggressively mature” to talk about people who denied the usefulness of emotions. I like that phrase. I also think people can be “aggressively mature” when they dismiss risqué humor for no good reason. In the end, I think maturity is somewhat subjective. The concept is good enough to talk about and to use in conversations, but defining the concept in black and white is difficult. Thanks for your comment Matt. You’re certainly correct to associate immaturity with childhood. After all, one could say that a synonym of ‘maturing’ was ‘growing’. The same is true of fruit we say to be maturing, and so literally speaking I don’t think anyone could disagree you on that point (unless there are any readers up for the challenge?). Of course the problem however, is that although the ways in which a fruit could mature are finite, and easily identifiable, the same is not true for a sentient life form. And this is why I’m hesitant to agree with you about emotions, and overwhelmingly in agreement about the subjective nature of the concept. In fact I’d probably go so far as to say maturity is entirely subjective. Personally, this struck me as quite good. I can well remember wanting an opportunity to die acting the hero in primary school, and even for a while in secondary school. Then, it seemed extremely noble. But now it seems like extreme immaturity, and quite possibly madness. I mean seriously, who wishes for a bad event, just so they can die to stop it happening? A noble end is one thing; but it was almost like I thought I’d be able to reap the rewards in terms of recognition. Of course I wouldn’t be able to; I’d be dead! However, there’s a book being written at the moment by Japanese Kamikaze pilot from WW2. His engine failed during his Kamikaze mission, and the war ended before he got another chance to do it. For years after he longed to have been successful in his mission, and to have died for the Emperor in a noble mission. And in his book he is collecting letters from many different Kamikaze pilots, sent out before their final mission. China accuses the author of glorifying Japanese aggression. But I don’t imagine finding that every single, or even most, letters betray immaturity. So even this, potentially my life’s most immature aspiration, could in the context of 1940’s Japan be seen to be dutiful, and yes, mature. And just like this example we could probably think of opposites for all other examples of either maturity and/or immaturity. P.S. I’d be interested in finding out more about relative fairness vs absolute abundance. Can you just explain the idea briefly? I thought a little bit more about this and I disagree that maturity is entirely subjective. If I am pointing to a child who’s articulate and I say “wow, he is mature”, you will know what I’m talking about and you will have enough information to go on. So to me, that’s enough to prove that maturity is at least inter-subjective. I actually think that maturity is in some sense objective: the concept of maturity only makes sense when talking to other people. It’s a public word that I can’t really relate to if I am by myself. But I understand your point: human beings can mature in multiple ways. I was making the point that as we “mature”, we probably value absolute abundance more than relative advantage. Sorry about my delayed reply. In your above example yes I would know what you mean. However my understanding would be subjective with respect to the group that we both belong to. So in fact I do agree that it is inter-subjective (new word for me so thanks! ), and not entirely individually subjective. There are some ideas or principles which almost everyone on Earth will agree to. These are what has given arise to the notion of ‘common sense’. Yet in reality there is only sense held in common where and when the opposing argument is absent. Head to a warrior culture where that child looked unable to defend his family relative to his peers, and perhaps people would think the child was the very definition of immaturity. I’m tempted, in my own inter-subjective understanding, to agree with your point that as we mature we probably value absolute abundance more than relative advantage. However I’m also aware that the reverse could equally be true. Judged mathematically, getting 2 as opposed to 1 will always be better (ignoring the inflationary consequences of expanding our example). However I can’t help but think that you’re linking maturity with emotion too much. Yes it seems immature to me when someone lets their emotions override their sense of reason. Yet what if I reasonably decided to pursue the option of relative advantage precisely because of the emotional consequence? As we mature we learn to control emotions. But we don’t cast them aside. In fact if you were someone with a body chemistry that gave you a highly emotional character, it would be the very epitome of immaturity to take decisions without regards to their emotional consequences. I still think using reason over emotions is a major component of what we mean by maturity. Of course, it makes sense to take emotions into account most of the time. And if you were to reason that you should take emotions into account, then that counts as mature. Perhaps a Rousseau quote belongs here. But if you were to just listen to your emotions without considering whether or not you should, then that would be immature/irrational/enslaved. In the end, I think that the concept of maturity is used a lot to try to convince people to conform. We might call someone immature because we are disgusted or bored with their social interactions. Or we might call a child mature to encourage them to behave more like an adult. Personally, I don’t set myself as a goal to be more mature. Wanting to be more mature is nonsense to me. If I were better read, I could probably find a quote from Foucault right about now.